"Sampath Speaking" - the thoughts of an Insurer from Thiruvallikkeni: China bans 88 millions of its members from joining Golf clubs !! China bans 88 millions of its members from joining Golf clubs !! One may not easily identify him – just as we could of Rohit Sharma or Axar Patel. At Chepauk on a slow pitch, India edged out SA …. Jason Day is an Australian professional golfer and PGA Tour member. Day first broke into the world's top ten in June 2011, rising to world number nine after his runner-up finish at the U.S. Open. In Sept 2015, Day reached World Number 1 in the World Golf Ranking. 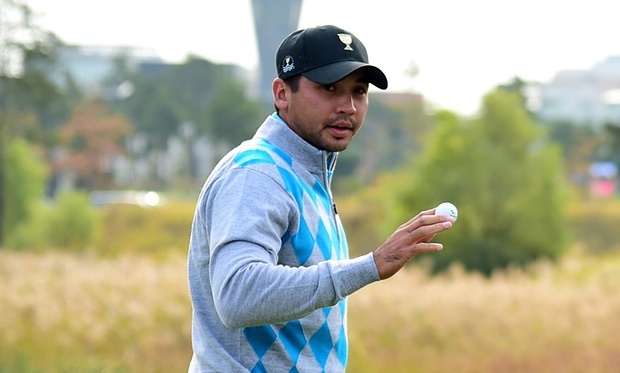 Jason Day has won the Don award for the most inspiring Australian sports performance in the past year, a prize accepted by the golfer's mother at the Sport Australia Hall of Fame dinner. On Monday morning AEST, Jason Day, the world number 1 golfer, shot a 68 in the final round of the Tour Championship. Rival Jordan Spieth shot a 69. Yet Spieth won the tournament, and with it, usurped Day's number 1 ranking. To add insult to injury, Spieth's win saw him take the FedEx Cup bonus, adding a tidy $US10 million ($14.24 million) to his $US1.4 million ($2 million) tournament prize money. Yes the stakes are high – it is rich men’s game ! – it is a game where you have Caddie, a person who would carry the player’s bags and clubs. A good caddy is aware of the challenges and obstacles of the golf course being played, along with the best strategy in playing it ~ and the game ‘ Golf ’ is a club and ball sport in which players use various clubs to hit balls into a series of holes on a course in as few strokes as possible. The game is played on a course with an arranged progression of either nine or 18 holes. Each hole on the course must contain a tee box to start from, and a putting green containing the actual hole. Golf is played for the lowest number of strokes by an individual, known as stroke play, or the lowest score on the most individual holes in a complete round by an individual or team, known as match play. The levels of grass are varied to increase difficulty, or to allow for putting in the case of the green. Miles away in China, the Chinese Communist Party has banned all 88 million of its members from joining golf clubs, in its latest update of party discipline rules. Extravagant eating and drinking, and abuse of power, are also formally banned, said Xinhua news agency. BBC reports that the party has in the past warned its officials to refrain from extravagant dinners and purchasing moon cakes using public funds. China has been conducting a strict anti-corruption drive since 2012. The new rule on golf states that members are banned from "obtaining, holding or using membership cards for gyms, clubs, golf clubs, or various other types of consumer cards, or entering private clubs". If caught, members could either receive a warning or be removed from the party, depending on the severity of the violation. The new regulations (in Chinese) did not explain why the joining of golf clubs is banned, but such clubs are often seen by the Chinese public as places where officials have cut shady deals. In September, local media reported that at least 60 employees in state-owned companies were punished for spending public funds on playing golf. Earlier this month, Lin Chunsong, a vice-mayor in the south-eastern Fujian province, was sacked for belonging to a golf club and playing golf while he should have been at work. China announced a ban on building new golf courses in 2004; however, the ban has not always been enforced, and state media say the number of golf courses in China increased from 200 in 2004 to 600 in 2015. One owner of a golf equipment store in Shanghai, stated that it was "about the social interaction", "If a company boss can't play with a government official, there's little point in him spending his money." Another new rule states that party members cannot "violate official provisions on hospitality management and engage in over-the-top entertaining, or take advantage of opportunities for extravagant eating and drinking". The Communist Party has also rephrased a previous clause banning adultery and mistresses, which now says that members are banned from "having improper sexual relations with other people which have bad repercussions". The party's strict rules for officials have in the past affected business for restaurants and luxury goods retailers in China and elsewhere. President Xi Jinping has led a major anti-corruption campaign since taking office three years ago. He has previously warned of unrest if corruption and perceived privilege within the Communist Party are not tackled.